I’ve decided that I’m going to write about my experiences on a chapter by chapter basis. There’s so much fun in figuring out who the culprit is in the various murders that take place in the killing game that is Danganronpa. Sometimes I get a firm grasp on who it is, sometimes I am led astray or see things differently enough that my initial opinions are wrong – regardless it all comes out in the class trial. It’s a great series so I’m excited to jump into a brand new iteration. I’ll also mention that I’m playing this with Japanese VA, because I just can’t do English VA on anime / animated media anymore. Japanese VA is just too good. While there was no murder in the prologue, we did get to meet the cast of this game – you can also see all of the characters in the embedded video above. So who are my favourites going in? First is Maki Harukawa. Not only is she sporting a hime cut with twintails, the main reason I like her, but she is also very mysterious. Love the red eyes and dark vibe she has going on – she doesn’t trust others and seems to stay pretty logical. Distances herself from everyone else it seems. Is she actually an “Ultimate Child Caregiver”? I have my doubts. Perhaps “child caregiver” can be interpreted in some other way? It definitely feels off that she is actually just good at taking care of children and nothing more. 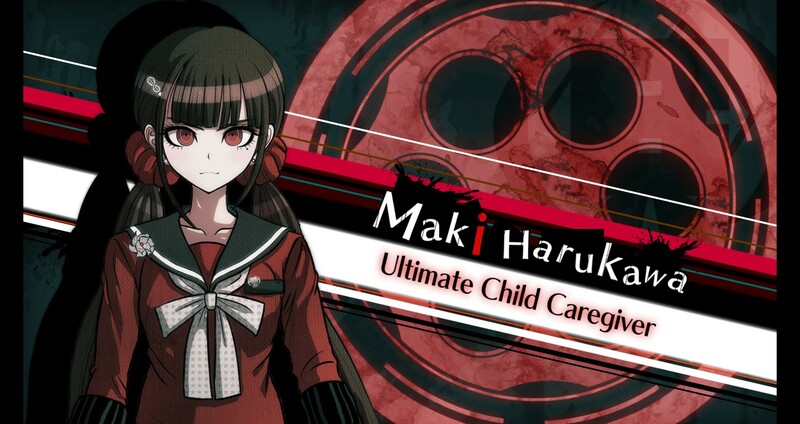 That said, I feel like it would be too obvious for Maki to be the mastermind behind this killing game. She has her secrets, but I don’t think she is a bad person – just a very cautious one. And second is Miu Iruma. Genius inventor, who has a lot of bark but no bite. I love how she acts super tough, but the moment she is actually confronted, she completely falls apart. A funny character who seems fun. She doesn’t really seem to have it in her to be evil. Honestly the only way I think Miu could somehow be connected to the killing game / mastermind is if she had invented this game’s Monokuma & friends, but then had forgotten about it. Which technically is possible because of how they can erase memories. Maybe she invented some of this technology before losing her memories? That said, it’s not like we haven’t seen this technology before in previous games… so who knows. Either way, I like Miu. I may be reading too far into things, but did you notice how the “i” in Maki’s name above was a different colour from the rest of her name? Well, all of the characters have that. A single letter in everyone’s name is a different colour for some reason. So I figured I’d write it out. This gives us the letters: K S H K j K C t S K Y O I H i R.
Doesn’t really seem like anything, does it? I’m thinking that maybe this is something carried over from the Japanese version, where highlighting certain kanji or whatever in their names actually has some sort of meaning. There’s always that one character that forgets their ultimate talent. Rantaro is the lucky character this time around. He seems like he knows more than he lets on. I wonder what his role is in the game, because I bet he is more important than most of the cast. Not sure what will happen with him, but that’s the impression I get. Just figured I’d note that here, try to get some good impressions / vague predictions in while I can. That’s all I’ve got for the prologue. Looking forward to the first murder case so I can dive into things. Especially looking forward to playing through a class trial, hands down the best part of Danganronpa games! This entry was posted in anime and tagged anime, Danganronpa, Danganronpa V3, game, thoughts by Yomu. Bookmark the permalink. Hope you enjoy the game! I played it a while ago but was genuinely impressed with the twist and turns the game had. I’m also not the brightest so take that with a grain of salt! I’d like to think that I know what I’m doing, but I’m sure the game will still find ways to stump me along the way. I hope you enjoy the game! My brother nagged me to play this game last year (or was it 2017? Can’t remember ugh) so this makes the first game I ever completed. I actually enjoyed it even if I didn’t play the first two games. The characters I loved there are Kokichi and Maki! I adored Gonta, too! Thanks. I definitely will enjoy it! You could even go back and play the previous titles if you wanted to then. The first one had some really good cases. I’ll definitely do that someday. For now, I’m enjoying other games and it’s taking me a long time to finish them so I don’t know when that will be. Hahaha! Only completed the first Danganronpa game, and own the rest of them which I haven’t completed. I did play a bit of Danganronpa Another Episode: Ultra Despair Girls which was a poor third person shooter. I’ve been told to play this one by everyone I know who played it. 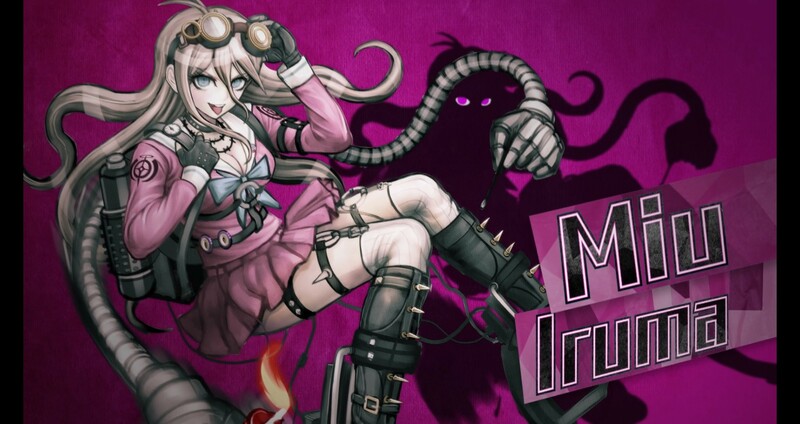 Miu Iruma sounds dangerous. I bet she created all the death devices in these games! Cruel creature! I doubt the highlighted letters means anything, but I noticed there’s no A, or E highlighted. With Danganronpa though, anything goes. Miu is great. One moment she is barking, the next she is cowering and sobbing. But yeah I definitely wonder if she had a hand in whats going on. Ultra Despair Girls didn’t look very good, I haven’t played it either. I think I just read a synopsis at some point for it. It’ll be funny if the highlighted letters actually mean anything, but I’m going to say its stylistic for now.